If you’re using an FHA loan to buy a condo, you might be surprised to find out that not all condo projects are approved for FHA financing. But that doesn’t mean you can’t find a great condo to purchase with an FHA loan. You just have to know how to look. The US Department of Housing and Urban Development, or HUD, has a list of condominium complexes it will and will not accept for FHA financing. A condominium complex must comply with certain standards set forth by HUD if it wants to get on the approved list. But if a condo project is on the list, you shouldn’t have much trouble buying the property with an FHA loan. Click here for today’s FHA mortgage rates. The units must be at least 50% owner occupied. In other words, if there are 100 units in the complex, at least 50 of them need to be owned by the person who lives there. No more than 50 can be owned by a landlord and rented out. There can be no pending litigation against the condo. This means no one is trying to sue the condo complex, and the complex is not trying to sue anyone. The condo complex must maintain minimum insurance requirements so that the building is not destroyed by fire or other calamities. The condo complex must be approved by FHA. This requires an extensive package of documents sent to and approved by FHA. Before you make an offer on a condo, you need first visit FHA’s website that lists currently approved condominium projects. Try searching by the condo’s name first. If you can’t find it on the list, try a broader search. For instance, try searching by just part of the condo’s name, or simply by city or ZIP code. Often, FHA lists the condo’s name a little differently than you know it. 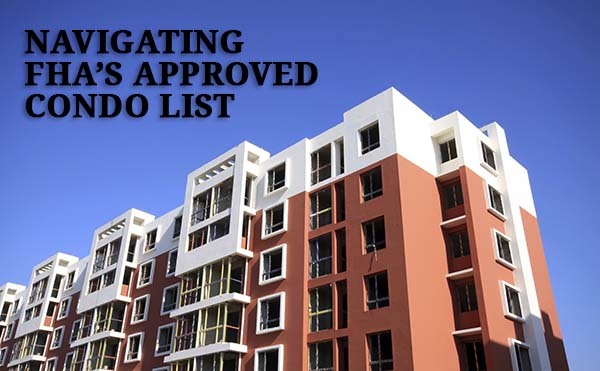 If the condo you are interested in is on the list, make sure it says “Approved” under “Status.” The website will show condo complexes in “Rejected” status as well. Also, make sure the approval is not expired. There are many condo complexes listed that were approved at one time, but have gone past the two-year approval period and have not been renewed. 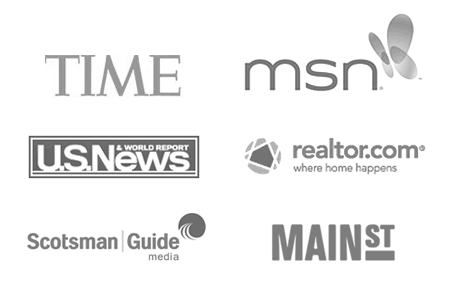 Click here for a free FHA condo rate quote. If you can’t find your condo at all, or if it is in Rejected or Expired status, you may want to pass on any unit in that complex. The FHA approval process is not something your lender can do in most cases. Although there are some services that specialize in approving condos with FHA, the process can take longer than you are willing to wait. In addition, approving a condo with FHA can be expensive and labor-intensive. It’s hard to convince a condo association to go through FHA’s 95-page document to attempt approval, just so that you can buy a unit in the complex. However, there’s a chance that the HOA representatives are getting pressure from owners to get the condominium approved. After all, it can be very difficult to sell a condo in a non-approved complex. All common areas must be complete and owned by the unit owners or HOA. At least 51% of the total units must be owned as primary residences or second homes. The budget must be adequate to pay for operating costs and reserves. At least 90% of the units must be sold and currently owned by unit owners (this applies only to existing projects, not new construction). No single person or company may own more than 10% of the units in the project. The project must be adequately covered by insurance. Keep in mind that you need a higher credit score to qualify for a conventional loan rather than FHA. To get a conventional loan rate quote or to find out more about this loan option, connect with a conventional lender here. Buying a condo with an FHA loan is a lot tougher than it used to be. In 2010, a condo complex didn’t even need to be FHA approved to buy a unit there. The lender would request what was called a “spot approval,” which was a short questionnaire. The condo management would answer a few simple questions such as how many units were rented, and if anyone owned more than 10 percent of the project. The completed questionnaire would be returned to the lender, and the FHA underwriter would approve the financing of that one unit. Now that Spot Approvals are gone, there’s no quick fix if the condo complex is not FHA approved. There is speculation that a new FHA condo spot approval program will be introduced. At this point, it’s not certain, and it will be a much more difficult process than it used to be. Still, there is some hope that, down the road, FHA financing will be available for unapproved condo projects. Ok, now for some boring stuff, if you’re interested! Today, there are two ways to get a condo project approved. HRAP stands for HUD Review Approval Process. This is where FHA itself approves a complex based on the package sent in by the condo’s governing body, usually the homeowner’s association or management company. Would you certify that a condo project meets FHA standards under risk of penalty by HUD if that condo did not actually meet standards? Neither would most lenders. It might appear that a home is a home, whether it be a condo, single family home. But condos are fundamentally different than free-standing homes. When owning a condo, you own the space of the condo from the walls in and you share the outside areas, called the “common areas” equally with all the other owners. You partially own the sidewalk, the swimming pool and the fitness center. Condos have their own rules and regulations that owners must follow such as whether you can hang a plant from your patio or paint your door hot pink. Aspects of the entire condo complex that have little to do with your specific condo unit can affect your property. Are your neighbors paying their HOA dues? Are there faulty windows somewhere in the complex? These factors and many more can put the marketability of your specific condo unit, or the one you want to buy, at risk. The last thing HUD wants is a condo unit it can’t sell to a new buyer, in the case that you default on your loan. Get an FHA condo rate quote here. When lenders evaluate a mortgage application they examine the property almost as much as they examine the borrower. A borrower may have an 800 credit score, a 25 percent down payment, and stellar debt-to-income ratios but if the property doesn’t qualify, there will be no loan. Lenders like real estate that is similar to property around it.If a property of the same type, square footage, bedroom count, etc., sold down the street, it indicates a market demand for property with those features. These similar properties in the area are called “comparables” or simply “comps.” Condos generally have a lot of comps, since there are often a lot of similar properties in the same building or in other condo complexes nearby. In this way, a condo can be very easy to appraise and approve. But when you’re trying to get an FHA loan, the property has an additional hurdle, which is HUD’s condo approval. FHA loans are popular among first time home buyers because of reduced down payments and lenient credit standards. Condos are often priced lower than surrounding single family homes, making the FHA-condo combination an ideal strategy for a first time home buyer to break into home ownership. That is, if the condo project is FHA approved. Borrowers can try for conventional financing, but conventional condo loans require a larger down payment. The buyer’s financial or credit situation might make conventional financing impossible. If you anticipate getting an FHA loan to buy a condo, you should research whether the complex is FHA approved before you get your heart set on it. If it’s not HUD approved, ask the condo association if it has an approval application already in the works. If so, ask when the approval is expected. You may be able to buy your dream condo with an FHA loan after all. Get an FHA mortgage quote for your upcoming condo purchase. Next story USDA Income Eligibility | How Much Can You Make and Get a USDA Home Loan?